I’m one of those doctors you go to see who runs all the typical blood tests, but then evaluates them for nutritional deficiencies instead of pharmaceutical ones. My typical patient is a middle aged woman who has seen at least eight other doctors and has been told her problems are all in her head. They aren’t in her head, they are in her gastrointestinal tract! So I help these patients get back to the diet we all were eating a millennia ago: Whole grains, minimally processed, lots of vegetables, minimal sweeteners and only unrefined ones when they are used. When Andrew first threw out the challenge of eating unprocessed, I had to ask: What process? What about things we bake, freeze, pickle, or dry ourselves? Are those off limits in this unprocessed month of harvest abundance? I was getting a bit panicked. You see, my family of four are all gluten-intolerant, and we already follow a “clean” and home-prepared diet. (For a great overview of what leaves your life when you go gluten-free, check out Heidi’s wonderful synopsis of living gluten-free from Day 9). My family has been gluten-free since November of 2005. But take away my lifeline of home baking and freezing and I would flounder! I routinely create gluten-free versions of normally-gluten-full baked goods simply because otherwise we wouldn’t have any in our lives. We have already weathered the conversions of holiday meals like popovers for Christmas, gluten-free, casein free birthday party cupcakes at school and girl scout events with grace and a sense of humor. 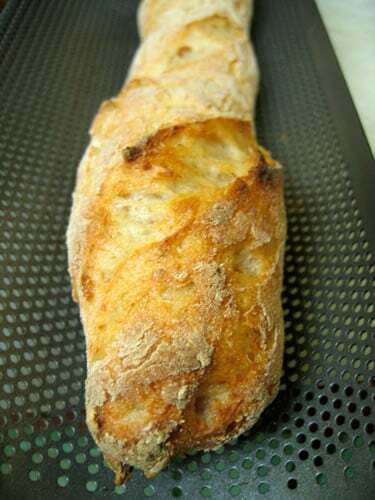 There is also nothing like fresh bread to make both the hearth and the heart grow warmer. So check out my chart of gluten free flours (click through for the full story) and use the ones with the greatest amounts of fiber, proteins, and complex carbohydrates to make things like this gluten free sourdough bread. Color Qualities Fiber Fat Protein Carb. That sourdough bread looks great. I wonder if it would work without the xanthan gum or if there is a substitute. I’m allergic to corn and try to avoid it (I know it shouldn’t have any of the corn protein in it but it seems to bother me anyway). Hi Shirin — I just googled “Substitute for Xanthan Gum” and found this page, which says that Guar Gum makes a good substitute. Since Jean already uses Guar Gum in her sourdough recipe, I bet you could just increase the amount and come out pretty close? You could just substitute all guar gum in the mix. I use both since the xanthan tends to hold the finer flours better and the guar works well on the larger starch grains. But all guar should be just fine. Let me know how it comes out, ok? Hi I have just found your site, I am wondering, I react very badly to wheat, crapms bloating etc, etc. But I dont seem to react to spelt. Since technically spelt is wheat, any clues on whats going on here? The most likely explanation for reacting badly to wheat and not to spelt is that you are most likely allergic or sensitive to wheat. Spelt is an ancient form of wheat, but unhybridized. That means the protein structures are different. Both Spelt and wheat contain gluten however so not having a large reaction to the spelt leads me to think you are not celiac. You may be gluten intolerant however. Thanks, thats what we figured. I do not eat large amounts of spelt or other grains usually. I eat a great deal of brown rice and I eat brown rice pasta. I do use spelt to make the occasional batch of biscuts or loaf of bread but its expensive and I dont over use it! I am wondering should I be cutting out the spelt, sticking entirely to gluten free? I ask because I have been told that an intolerance can lead to celiac if you continue to consume large amounts of gluten, dont know if its true, but Id prefer to be able to consume small amounts of gluten like out at resturants than to end up having the issues surrounding celiac. I have found that the issues I have with wheat match exactly to what my friend experiences and she is a celiac. Thank you. Your last line truly says it all. If you react with all the responses your celiac friend has, then you are most likely gluten intolerant. But this is truly not the best place to discuss this complicated and important medical decision. Feel free to schedule an online consult or skype call with me if you have no other medical professional to consult. Thank you for pstiong this! I find it highly annoying when people say that spelt is gluten-free, because as you stated, it is not! !